I am home for a couple of days and my house is clean and laundry is done. So, that being said, you just might see an overflow of projects from me in the next couple of days. Hope you like what you see! I know I'll have fun creating!! 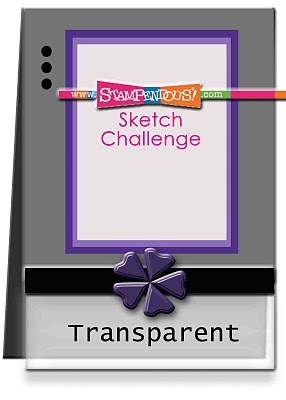 I saw this sketch over at Stampendous. I wanted to use my American Crafts adhesive fabric, so I combined it with their challenge to use 2 or more Dear Lizzy products. I have several Stampendous stamps, but this particular one is a favorite go-to stamp so I couldn't help but use it. I embossed the sentiment to make it pop a little more on the adhesive fabric. Love this one, Brenda. I am totally expecting an overflow that will inspire me to get busy! Can't wait to see what you do and I know I'll love them all, just like this fabby card.